If we were having coffee then we would be having tea. I am currently drinking some Puh Er, but I can make you a Oolong (either from Taiwan or China) or a white tea, or a black or green one (these three are from China) if you wish. I can completely understand if you aren’t a fan of it’s rather agressive side. If we were having coffee tea, then we’d be snaking on strawberries, apples, prunes and grapes as well as some other fruit. We would be trying to stay quiet as little on is sleeping in the other room and she is very much in need of sleep (I think she is having another growth spurt). If we were having coffee, then I would ask you how you have been. So how are you? I’d ask you about your plans for the weekend and for next week. What have you planned? If we were having coffee, then I would tell you about my doings of the past week. Currently S has Sundays and Mondays off, so we had a real weekend, as I had no work on Monday. We made the most out of the beautiful weather. We have suddenly landed in Spring, even though today it’s a bit chilly outside. I made the acquaintance of two of my dad’s friends whom I had heard of quite a bit in the past 16 years but hadn’t met so far. I took little one out to the playground that is less than 5 minutes from our house, she loves hanging out with the other kids, there are quite a few who are a lot older (it’s Spring Break) but they don’t mind her presence. There are some cool slides on one of the playgrounds and if I would let her we would be spending hours there. On Wednesday I picked up my new insoles for my shoes. I had no idea that I needed a correction for my feet, but I actually need one, now it’s time to buy a new pair or two of shoes as I am not meant to have too flexible sole, and my Spanish plimsols are more than just flexible, and it is time to change anyways. Not this week but the week before I did an x-ray of my hips and bottom of my spine to see if I needed a little heel for my feets’ correction. Well no, but I have a dislodged vertebra at the bottom of my spinal cord (probably since birth, but it had not been discovered until now), so this means no more heels (my sister will be happy about this), and maybe some for of correction. It doesn’t hurt, so maybe there won’t be much done. My GP is currently on holidays so I’ll be able to tell you more in a few weeks. If we were having coffee, then I would tell you that I had lessons with two new students this week. One is only for a short time, but the other will probably become a more serious client, I am already going to teach him again on Monday. I would also tell you that Monday I will be busier than usually as I am going to have another new student that day and will be running around quite a bit. I am really excited about all this, as I want to work a bit more. If we were having coffee I would confess that yesterday I did not put up my A to Z post! 😳 I only put it up right before sitting down for coffee with you. In my defence, yesterday we had a great family day as S was off work, the weather was beautiful and I worked. So my T post will be written today, but I will probably put it up tomorrow. I am also hoping that I will find the time to write a #weeklysmile post for tomorrow. If you haven’t heard of the #weeklysmile or haven’t participated yet, then I do invite you to check out this beautiful event hosted by Trent, a fellow coffee sharer. If we were having coffee, then I would also let you in on my plans for the weekend. Today I will be writing as much as possible, and spending some good time outside with little one. Tomorrow we are planning to go to the Petit Palais and then shoe shopping in the Champs Elysées Adidas store, as that one is open on Sundays. I hope that you’ll have a great weekend! It was amazing having you for coffee, and if you want to participate yourself in the #weekendcoffeeshare or want to read some other chatty posts this weekend (and beyond) then please head over to Diana’s lovely blog Part-Time Monster! Hi Solveig! It is finally Spring here too. I’m joining you in tea, at least in spirit, drinking a nice black tea. I’m sure the exact type, but the name is “Golden Monkey” and it cost a lot more than I should have paid. Still, it’s good. I hope just the correction in your shoes is enough. A few weeks I had a major discussion with quite a few people about the importance of the right shoe on back health, so I finally got new running shoes. With all of my time in Paris, I never visited Petit Palais. Maybe next time. I hope you have a great week! Thanks for the call out on my Weekly Smile! I hope that the correction will do it’s job. Now when I buy shoes they have to be flat, flat flat so that I can put those insoles in. For running shoes my doctor advised me that if I want to run to try without insoles but to only use shoes that come without a particular support. At the moment my legs’ muscles are meant to be strengthened on one side and shortened on the other so that my feet won’t fall inside too much and that I don’t put too much pressure on one of my feet. I haven’t been running in years as most of the time it hurt my legs way too much, but now I know that this was due to the way my feet hit the ground. The running shoes I did buy could just not correct my problem completely. The Petit Palais is really nice, it’s free entry and has a beautiful courtyard garden. My weekly smile post is all ready and scheduled for tomorrow 🙂 I hope that it will make some people smile. I don’t remember if you were in on the conversation, but my “new” running shoes were messing up my back. I just picked some up that are so much better. They feel almost like I’m barefoot, which is what I need. If I feel the shoe, any shoe, it hurts.Shoes are very important! I did talk to you about that a few weeks ago. I am glad that you have good shoes now. 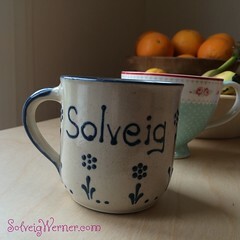 Hi Solveig, sounds like you’ve been busy! By the way, what do you teach? Having new students to teach when you want added to your work load. When I was out shopping I manages quite few smile , one little girl I couldn’t get a smile from. Glad you are getting students when you need them. I know what you mean about getting help for your feet. If only you knew when you were 18 what you learn in later life perhaps the feet wouldn’t have required any assistance. Thanks for tea. I do hope that with time my feet will be ok without assistance. But apparently my back problem (which thankfully does not hurt) should have been corrected while I was growing and might cause problems later on, at least now I can do my best to avoid them. Thanks you for the tea. I’ve never heard of Puh Er but I love strong coffee so it may be my “cup of tea!” 😊 Glad to hear you are caring for your feet. I myself have no arch what so ever and I tend to swing my left foot in (been like that since childhood) so I would be lost without my orthopedic insoles. They make all the difference especially since I am on my feet so much of the day. Heels are also a no-no for me too. Both for comfort and because I am so very clumsy I would be a hazard to myself and others!! Hope you enjoy the rest of your week. Congrats on the new students! Time with family is always more important than putting up your blog post. Always. You have your priorities straight!